Welcome to LukeJernigan.com, the online home for Luke M. Jernigan. I am a 33 year old Search Engine Optimizaion (SEO) Consultant with a Bachelor of Science in Visual Communications from Ohio University. I previously have worked as a Webmaster/Web Developer/Web Designer and I am the President of LJ Web Services, a Ohio SEO strategy consulting firm. Previously I worked as a eMarketing SEO Consultant for Brulant, a leading Interactive Agency near Cleveland, Ohio that was recently known as Rosetta and has again been acquired. I have also worked as the Webmaster on the Marketing team at ROCKY Shoes and Boots in Nelsonville, Ohio. In my work past as an Search Engine Optimization Consultant I have had the honor of working with clients both large and small; from advising small start-up businesses on SEO and how to promote their Web site to running major SEO and link acquisition campaigns for large financial instituions and one of America's largest insurance agencies. It is with this experience that I have grown even more passionate about SEO; a field that I many times compare to my love of sports. It is this fire that motivated me to launch LJ Web Services, LLC, where I now help small businesses across the USA improve their online traffic & conversions throught Search Engine Marketing. My entrepreneurial spirit has served me well in my business career as I launched Intimidation Clothing in 2009, a MMA clothing company producing MMA hoodies, t-shirts, fight shorts and more. With the expert online marketing of LJ Web Services on the back end and my great connections helping out in graphic design, video production, Pay Per Click Marketing, Web Analytics, customer service and more, it's clear to me that Intimidation Clothing will one day be a huge hit in the MMA & combat sports world. Find more about my work in the MMA world as well as my roll on the weekly Ohio MMA Radio program here on LukeJernigan.com. Growing up in a suburb of Columbus, Ohio, I never gave any thought seriously about going hunting or about modeling. But my employment at ROCKY changed all of that back in 2002 as I became a "model" during my first month on the job. So what is all of this about? Well I guess you should click here to find out more about something that I got a real kick out of while I was working at ROCKY. 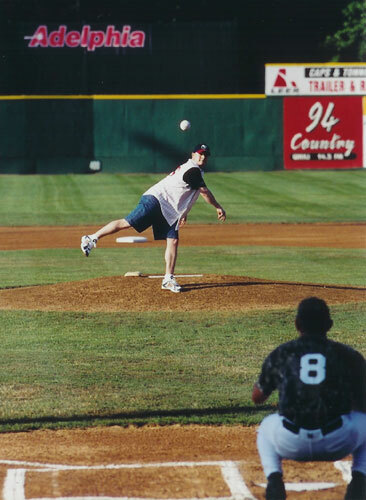 Prior to my moving into the SEO industry, I had the opportunity to throw out the 1st pitch at a Chillicothe Paints Minor League Baseball game in June of 2004. Having grown up a passionate baseball fan, this was one of the more thrilling sports moments of my life.